NSR’s Global Assessment of Satellite Capacity Supply & Demand, 15th Edition (GSCSD15)is the longest running and most detailed source for satellite capacity analysis worldwide. 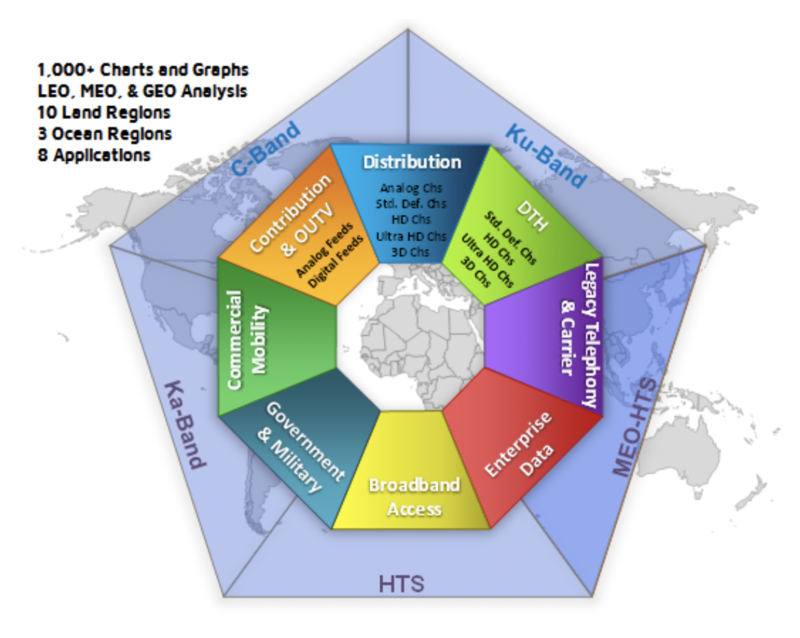 Building on over 18 years of regular NSR reporting and in-depth satcom data, GSCSD15 provides key assessments of applications, orbits, frequency bands, capacity pricing and revenue potential across 13 regions. It is a “must have” report for anyone seeking bottom line data and analysis on the ever-changing satellite capacity market. 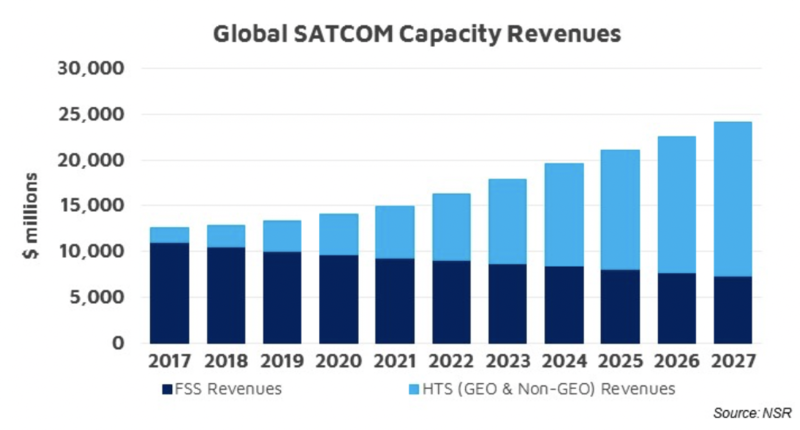 The satellite industry is in the midst of a profound transformation, which is leading to a rebalancing of the revenue pie and deep changes in satcom business models. On the one hand, revenue performance has declined for many operators impacted by severe pricing pressure and slow demand. However, risk has led to reward for those that have tapped the data markets armed with innovative capacity and business models. GSCSD15 found that via a 10-year horizon and market outlook, the satellite industry today can be considered at the beginning of a golden age where actors that best adapt to the new framework can capture sizable growth over the long term driven by key data-centric verticals. 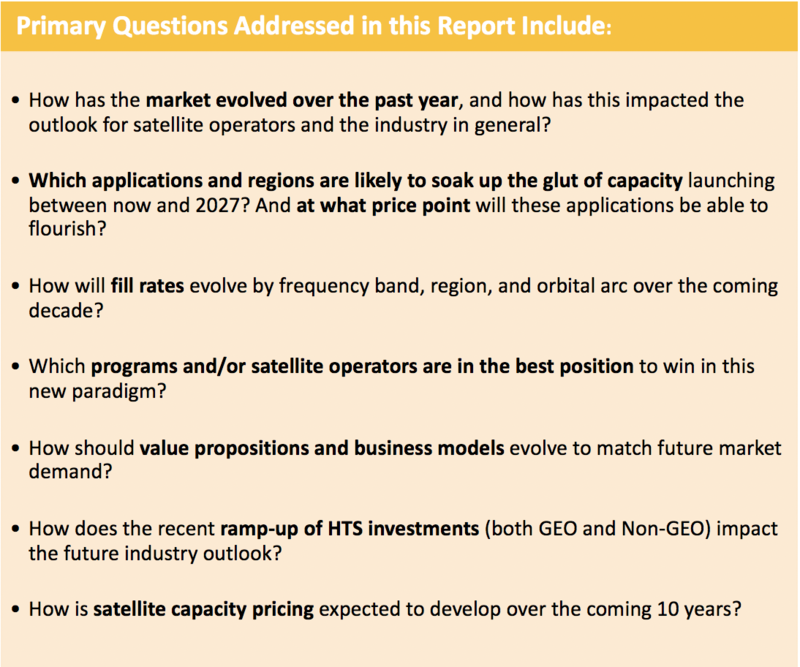 Bottom Line: Where is satellite capacity supply & demand headed for FSS and HTS over the next decade? GSCSD15 quantifies the dramatic changes taking place in the satellite industry both now and over the next decade. With data from NSR’s library of reports, combined with the company’s signature holistic analysis, GSCSD15 is the go-to tool for in-depth understanding of the industry, with sufficiently granular data points to allow for bottom-up assessments of specific markets and trends. Containing over one thousand supply, demand, and revenue forecasts and regional market share estimates complemented by NSR’s signature qualitative analysis, GSCSD15 leaves no stone unturned, and provides coverage of all major trends impacting the satcom industry today & tomorrow. 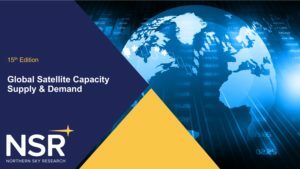 The Global Satellite Capacity Supply & Demand, 15thEdition study segments FSS C-band, Ku-band, and Ka-band capacity, as well as GEO-HTS C-band, Ku-band, and Ka-band. The study includes Non-GEO-HTS capacity (LEO+MEO). 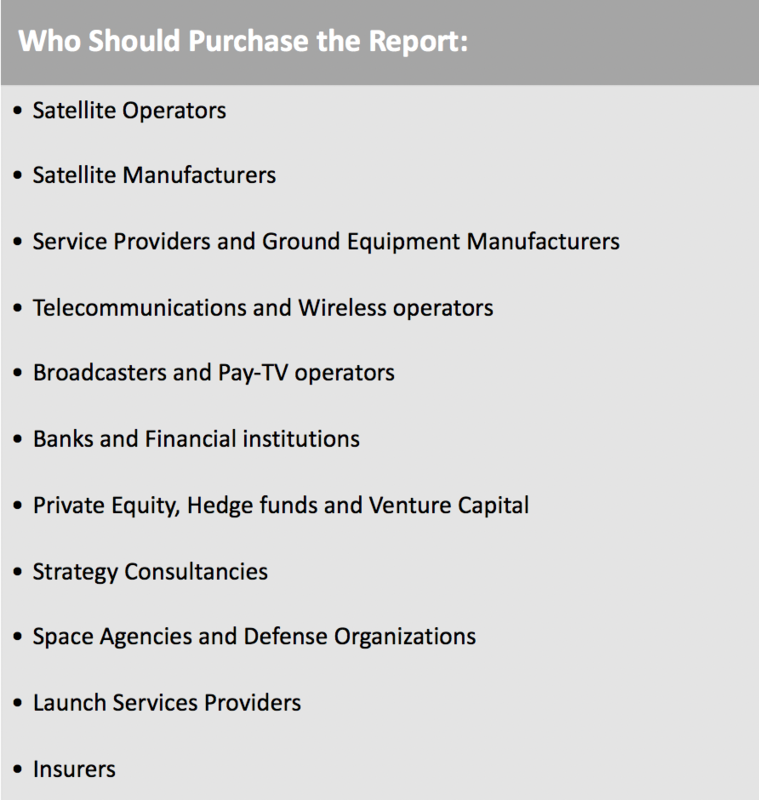 Further, the report utilizes data and forecast information from NSR’s VSAT & Broadband Satellite Markets, Government and Military Satellite Communications, Aeronautical Satcom Markets, Maritime Satcom Markets, and Wireless Backhaul via Satellite studies, topped off with significant analysis of GEO-HTS, MEO-HTS, LEO-HTS, and their respective impacts on the industry. 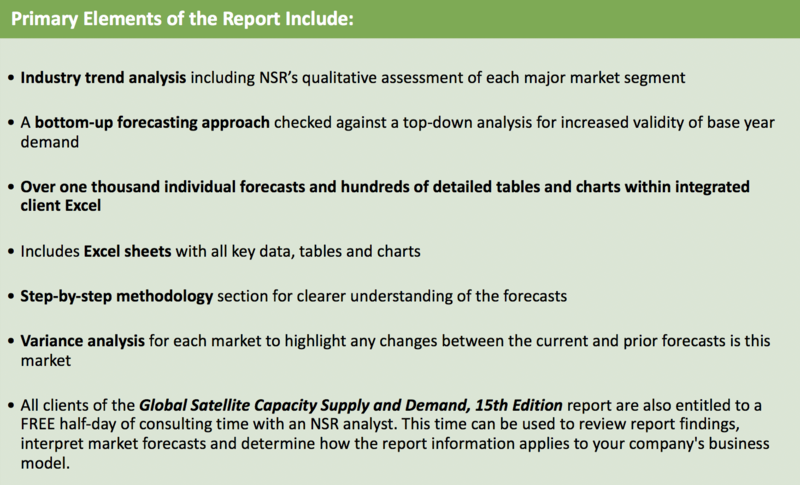 All said, this NSR report provides the most comprehensive view of the satellite market and the trends shaping it today. In fact, the GSCSD15 study coupled with NSR’s other applications-specific market research studies combine to form an integrated library of detailed and highly granular research on the commercial satellite market. NSR’s clients are varied and we understand you have a variety of needs. To suit your individual requirements, the Global Satellite Capacity Supply & Demand, 15th Edition study can be tailored to provide you with the data you desire and leave out that which is not of use. 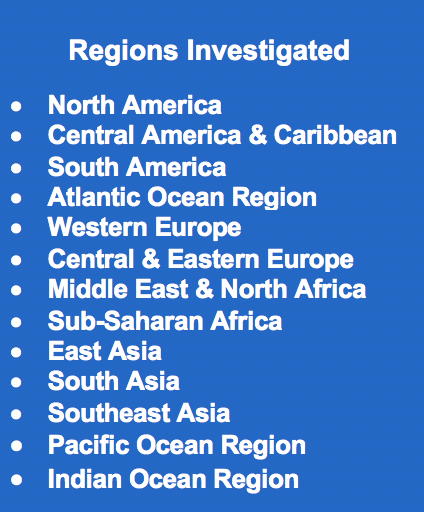 If your company does not require our detailed analysis and extensive forecast of all 13 regional markets, then choose only the 4 regions that best suit your needs. Further, with the tailored report, you will still receive the Executive Summary, the global market overview and the Methodology chapter (Annex) along with the Excel files for the four regions you have selected. Companies and Organizations mentioned in NSR’s GSCSD15: Intelsat, SES, Eutelsat, Telesat, OneWeb, SpaceX, O3b, LeoSat, Echostar, ViaSat, Hispasat, Star One, Telenor, Avanti Communications, RSCC, Gazprom Space Systems, Turk Telekom, Spacecom, NileSat, ArabSat, YahSat, ABS, Inmarsat, ChinaSat, AsiaSat, KT Sat, APT Satellite, SKY Perfect JSAT, Thaicom, Antrix / ISRO, MEASAT, SingTel Optus, PT Indosat, PT Telkom, NBN, Arsat, Azercosmos, NigComSat, Claro, E’shailSat, Global IP, HellasSat, Intersputnik, Kacific, Hughes, Gilat, iDirect, Newtec, Comtech, Panasonic, go go, GEE, Reliance Jio, Speedcast, Telefonica, Marlink, Globecomm, and Telespazio.